Posted on May 28, 2018, in Card Samples, Debbie's Challenge Entries, Oscar's (Deb's) Card Samples and tagged Doodlebug, Lawn Fawn, Spellbinders. Bookmark the permalink. 11 Comments. This is SO cute and so much fun as well. Great creativity on this fun card. Love his bow tie and glasses. He looks ready for anything. I am sure that is because he had his coffee. Cute card. Awesome card. Great design and so much fun seeing he Llama with the coffee cups. So cute. 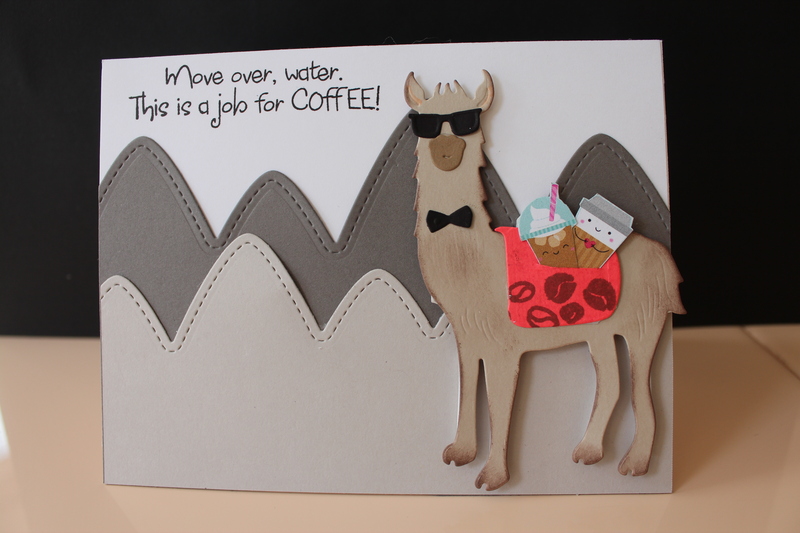 Awesome thought, love the cute Llama carried coffee things so beautifully! okay, now how fun is this?! I have that die and need to use him. Love this fun scenery. Who makes that sentiment? The sentiment is from Inky Antics Yawning Coffee Lady. hahaha! Awesome! Love those two little coffees tucked away in his saddle… very sweet and made me giggle! So cute the way you added the stickers to the saddle. What a cute card design. Awww!!! Love this Llama! Really fun!!! Bwahh ha ha ha!! Love this!